I told him "Go pose. Pretend you're pointing at something interesting. Make it look natural." First, there was a breeze, which was met by our complete gratitude. Our amble was laborious, due mainly to the sweating, and because Matt had to carry the aforementioned 37 lbs. of sniffling drama most of the way. We strolled along, keeping to the right, as is the unspoken rule. I learned this after nearly being run over by a bicyclist. She rang her happy little bell, which obviously wasn’t intimidating enough for this New Yorker, so I remained unaware on the left until near collision. At regular intervals, semicircular benches protrude over the water from the cement wall, where my withering son sat to sip his drink. 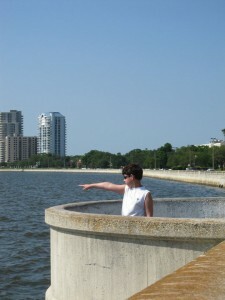 We enjoyed the views of the water, the outdoor art installations, and the architecture. Some of Tampa’s most prestigious homes, many on the National Historic Register, line the street. There is plenty to see, especially when you’re not whining about how hot it is (ahem…cough). Military planes fly low on their descent to the MacDill Air Force base, which sits at one end of the boulevard. Pelicans and other sea birds swoop down for their lunch. Although we didn’t see any, my sister-in-law regularly sites hammerhead sharks, and the occasional dolphin or manatee, swimming in the bay. 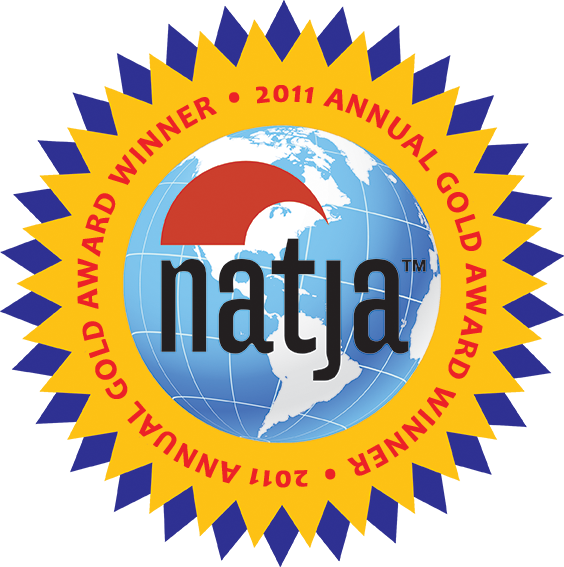 It helped that we had some insider scoop from my brother and his wife, who lived in South Tampa for many years. They steered us to the free, shady public parking at the Bayshore Patriots Corner lot on the corner of Bayshore Boulevard and Bay to Bay Boulevard. Parking is also available at Ballast Point Park and Fred Ball Park. 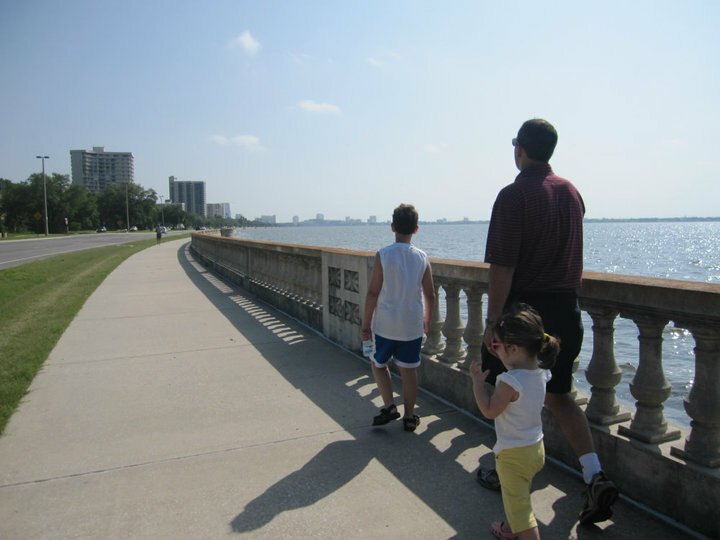 Built in the early 1900’s, Bayshore Boulevard is deemed the world’s longest continuous sidewalk because its 4.5 mile stretch of concrete is not interrupted by cross streets. This 10 foot- wide sidewalk starts at the Columbus Statue Park at Platt Street on the north end, and ends at Gandy Boulevard. It’s an official greenway trail, with amenities like benches, a water fountain, bicycle parking, a city marina and fitness stations. There is also a three mile on-road bike lane along the north-bound lane, between Rome Avenue and Gandy Boulevard. Fifteen cast bronze trail markers are embedded in the sidewalk, denoting each half mile and kilometer southward along the trail. Parking is across the street. But I really took this pic because I loved the yellow flowers on this plant. Bayshore Boulevard is also the site of Tampa’s annual Gasparilla parade, a “colorful” (read: drunken revelry) celebration of a legendary pirate invasion. This is a 4 in my book. 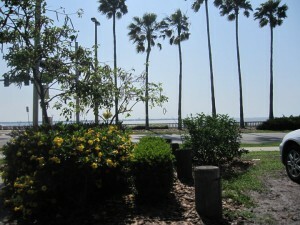 Don’t make a trip to Tampa just to walk along Bayshore Boulevard (I’m thinking you probably won’t, but just in case). It is free, picturesque, and great if you’re a runner in need of a good trail. However, unless you’re part amphibian, skip the venture on any day the humidity levels are 95 percent or higher. Which pretty much just leaves January 10th. Maybe the 11th as well. Not a cloud in the sky. Not. One. Single. Cloud. 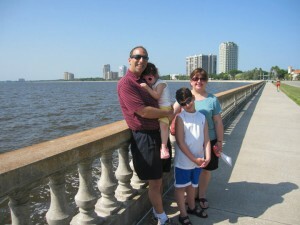 I notice that you mentioned your parents and your brother’s family live in the Tampa Bay Area, yet only the four of you and the parents walked the “surface of the sun walk”. Your brother sure sounds like a bright individual opting against the 170 degree adventure. The pictures look beautiful. Maybe a walk down this path in the Tampa “winter” would rank higher on your scale. Has everyone met my brother Mike? I think it deserves more than a 4! You New Yorkers can’t bear the heat, we can hardly manage, but it is a beautiful walk, bike, stroll, run most of the year. Stingrays are regularly sited as well and the houses along the trip are gorgeous! The pics are great. Maybe bikes might be the way to go next time. Having all the fish, houses, etc. to look at too sounds nice. I think anything to deflect the fact that you are exercising in excruciating heat sounds good to me. Howdy… Nice blog you have here. Looking forward to your future posts.